I’ve known about Dragon Quest from a young age, since back when I first had my Game Boy Color. However, back then I didn’t know how RPGs besides Pokemon worked, so of course I didn’t have much interest in them. My first foray into the franchise was with Dragon Quest Monsters (Dragon Warrior Monsters in North America), a monster raising spin-off likely meant to capitalize on the overwhelming success of Pokemon — even though Dragon Quest Monsters expands on mechanics introduced in Dragon Quest V, released a whole four years prior to the original Pokemon games in Japan — but looking like Pokemon is what got me interested in it, just from the North American box art. I liked the game enough that I also got the Dragon Warrior 2 and 3 pack, thinking it would be the same. Imagine my surprise when I found out you couldn’t recruit monsters. 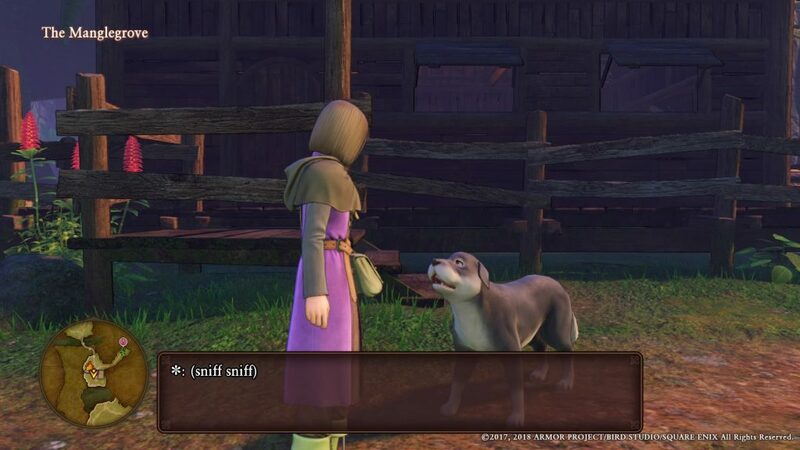 Fast forward to earlier this year, where I’ve now experienced several other Dragon Quest spin-off titles. After hearing that Dragon Quest XI: Echoes of an Elusive Age would be coming to the west, I decided I might as well give the main series another try. Most older, traditional JRPGs I become bored with easily without some kind of monster taming aspect thrown in. I’ve tried some of the older mainline Final Fantasy titles and for some reason I can never really get into them, so maybe I’d have better luck with its main competitor since I enjoyed the spin-offs. And boy, was I right. My excitement was palpable once I finally got my hands on Dragon Quest XI. As soon as I got to the introductory area, I was amazed by how gorgeous it was. It may not have the realistic detail of a game like God of War or Spider-Man, but its anime artstyle will help it age well. Additionally, just because the graphical style is more cartoony, that doesn’t mean Dragon Quest XI lacks detail, far from it actually. From the grass to the scales on dragons, to the detailed noses on more beast-like enemies; you can tell a lot of care was put into the art of this game. Akira Toriyama (creator of Dragon Ball) has been designing characters since the very first Dragon Quest, and it shows since many characters look like his more famous creations. 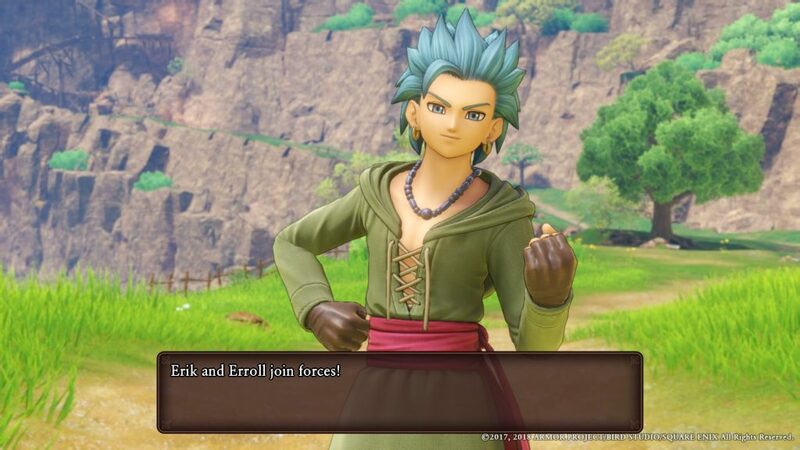 My favorite character in Dragon Quest XI, Erik, has some spiky light blue super Saiyan hair as well as the bang taken straight from Adult Gohan. The familiarity might bother some people, but their appearance often belies their true nature, and in a way that helps add more charm to the series. Having that said, it doesn’t really help my earlier point when power-ups and attacks look and are named like they came straight from Dragon Ball Z. As for gameplay, having played some of the other titles in the franchise, meant that I was already familiar with many of the spells, weapons, and armor you can obtain. What I didn’t expect was for there to be a status affliction which makes characters dance and unable to attack, with each character doing their own dance, such as the main character doing the Carlton and Erik doing the moonwalk (because of course he does). This has been a staple in the Dragon Quest series for a long time, but this is the first time I actually saw it, as many older Dragon Quest titles don’t show your party members on screen, and is just another small but welcome addition. 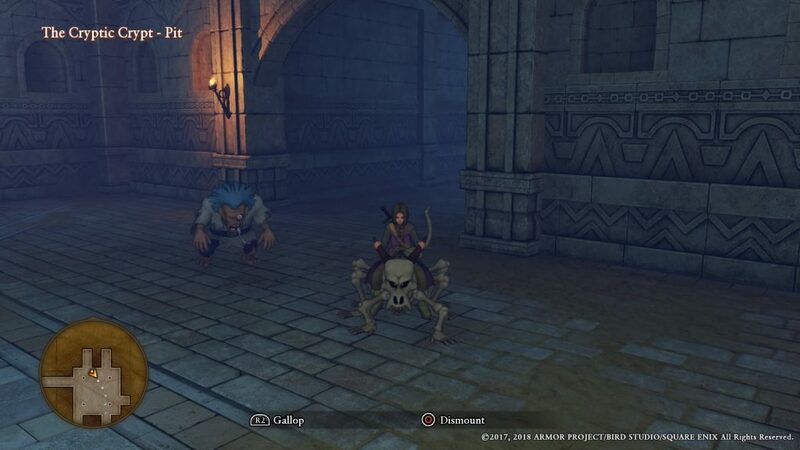 One small and new feature I enjoyed was that some monsters are mountable after being defeated in battle, so you don’t always have to stick to riding your horse. Mountable monsters can help you reach hidden items and are actually necessary for climbing some areas as well, at many times actually have more necessity than your horse. 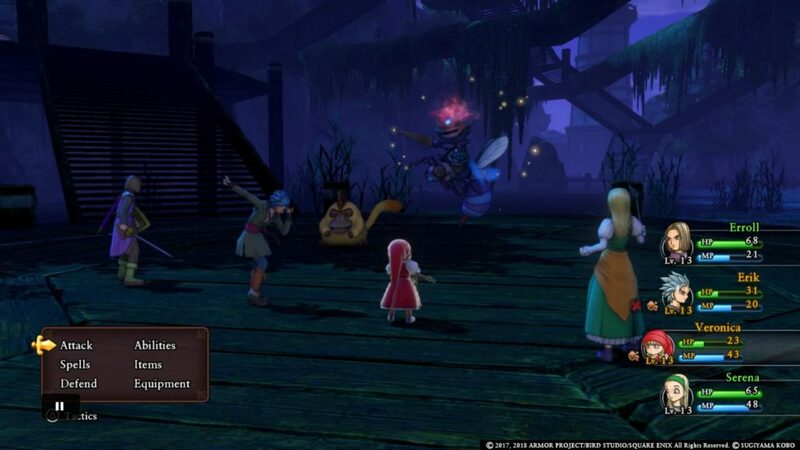 A feature that has been present in the Dragon Quest series for a long time is that you can choose what your party members do instead of always giving them orders. In addition to following orders, all characters can be set to Show No Mercy, Fight Wisely, Focus on Healing, Mix It Up, and Use No MP. 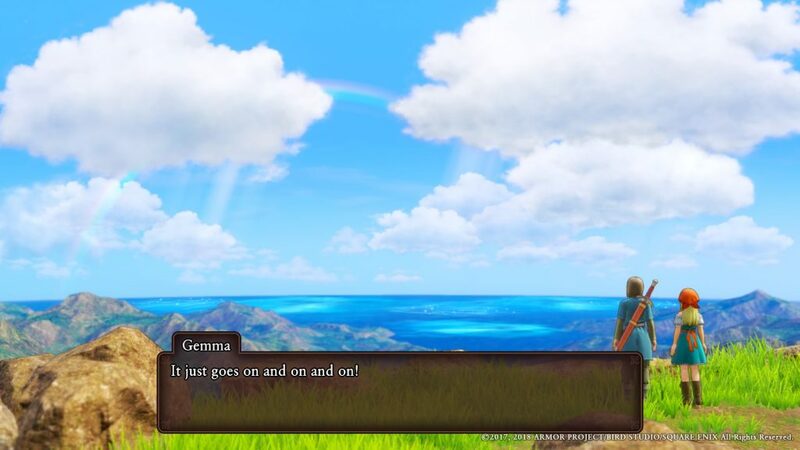 Luckily the AI in Dragon Quest XI is smart enough that it doesn’t make terrible choices all the time (though it can depend on player preference), and these options are great for level grinding. Some might argue that you’re letting the game play itself when you do it this way, but since you still have to get the characters to each area, buy or forge and equip new weapons and armor, and manage skill trees, I’d say it just helps to save time in this 60 hour JRPG (about 75 to 80 hours if you want the “True Ending”). Of course, when fighting bosses it’s usually better to have at least one character following orders, preferably the main character, since none of the characters can use inventory items on their own, and tactics can always be switched both inside or outside of battle. The story itself didn’t feel all that remarkable, just a traditional JRPG story where a chosen savior of light has to save the world from an evil lord of darkness, with several party members joining him on his quest. Then again, that is kind of the point of Dragon Quest, to stick to tradition rather than having a ton of differences in almost every entry. Despite the familiar and perhaps overdone story, there were quite a few gorgeously made and powerful scenes. A particular instance which comes to mind is one involving a character telling the story of a fallen kingdom and involving butterflies, which doesn’t sound as strong on paper but what I experienced was as beautiful as it was tragic. 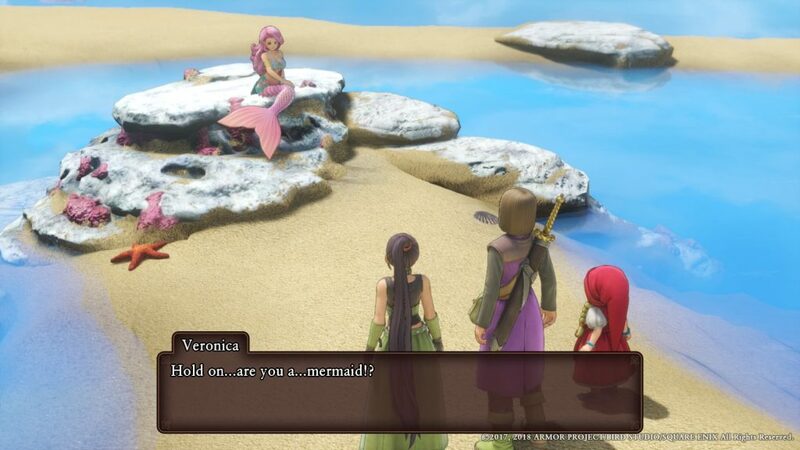 No matter how rote the story is, as long as JRPGs like Dragon Quest have noteworthy scenes worth remembering, they’ll still be regarded as some of the best experiences video games have to offer. 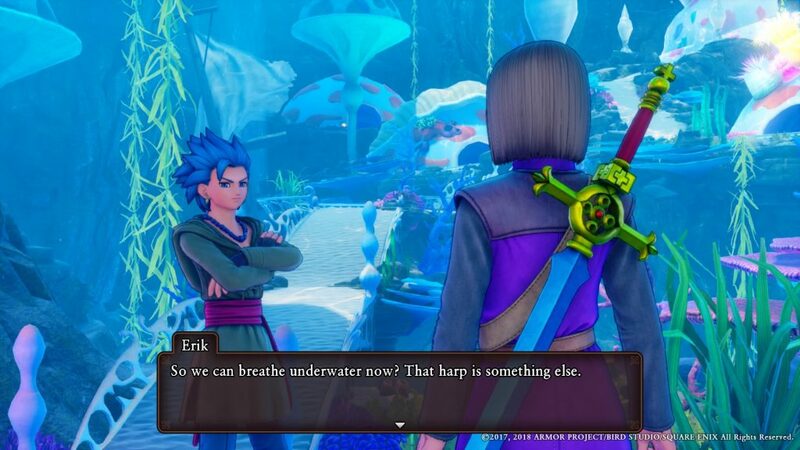 Tradition is the same reason why the original Japanese version of Dragon Quest XI features text-only dialogue and no voice acting, but why the English version does include it (although Dragon Quest XI S will feature Japanese voice acting). I think the voice acting is fine, besides Erik starting with a vaguely New York accent and then losing it at a certain point, and without the voice acting, I feel the more emotional scenes would be less impactful. It seems mouth movements were even added to better match to what the characters were saying, which is a great level of detail that you don’t see that often in localized Japanese games. While most of the older titles don’t have the detail, quality of life changes, or voice acting that Dragon Quest XI does, I’m still curious about them, and now I’m much more excited to play them than I ever was before. For now I have other games I have to cover, but in the near future I’d like to finish Dragon Quest V, play Dragon Quest VIII: Journey of the Cursed King (commonly known as the most popular mainline Dragon Quest title in the West), and see what some of the other titles have to offer. As for the spin-offs, I’ve already been intrigued by Dragon Quest Builders 2 after playing plenty of the first game, and the quality of life changes and multiplayer aspects just excite me more, if only it would receive a western release date soon. 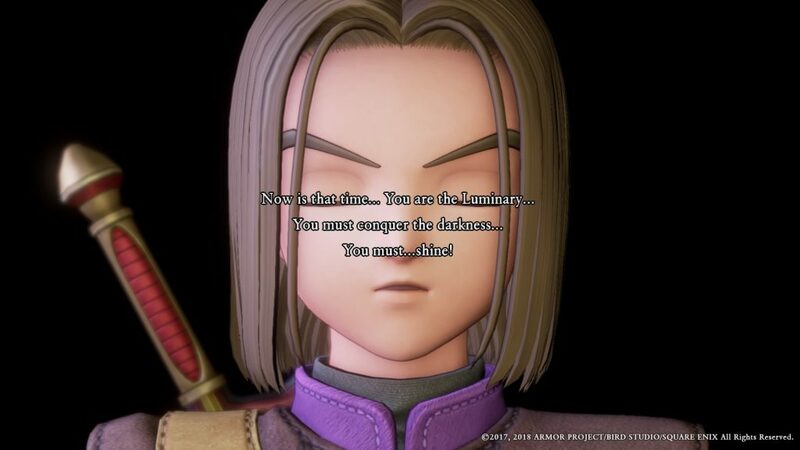 Dragon Quest XI: Echoes of an Elusive Age is the best JRPG I’ve played this year, and even though we don’t have all the different versions in North America and it hasn’t been selling that well on Steam, I’m hoping we’ll still see plenty more Dragon Quest titles released outside of Japan in the near future. Dragon Quest XI is available on PlayStation 4 and PC, with a Nintendo 3DS version exclusive to Japan and a Nintendo Switch version, Dragon Quest XI S, currently in development.